Is your marketing campaign getting the response you're expecting? If you're like many business owners, you're looking for ways to maximize your impact and get a good ROI for your efforts. Sometimes, the simplest moves are the most effective; and a follow-up is one of those moves. 1. Segment Your Leads The first step in identifying which leads to prioritize is to identify where they are in the process. Not all leads are created equally, and some people just aren't ready to do business. Automated tracking allows you to identify the hottest leads and direct your efforts where there's the best chance for results. Divide your leads, and use a different approach to each group, starting with those who are right on the edge of making a commitment. 2.Use Personalized Follow-up Messaging Even though customers realize you're reaching out to them because you want to make a sale, they're less likely to be turned off by your pitch if it doesn't seem like a pitch. If you're following up with a lead, that means they're already aware of you and what you're selling. Make the follow-up about them and the value of your offer to their life. 3.Be Persistent, But Not Pesky Most deals take at least three contacts to close. You want to direct your first follow-up shortly after the initial contact, and set a definite point in time for the second. Using Postlead hand-written post cards, address your contact by name, remind them of your initial contact, and set a deadline for response. It can be something as simple as: "Hi John, Just a quick note to remind you about [reason for contact]. I really think it will help you with [need]. If I don't hear from you by March 10, I'll contact you on the 11th. Hope all is well, [Your name]." This reminds them that you have a solution that benefits them, and provides a definitive time for them to respond. You can also add incentives like a specific price for responding by a certain date or adding a guarantee. Use your response from the first round of follow-ups to further refine your leads, message, and approach for successive contacts. Postlead recognizes that simplicity is key, and has created an automated mail system that makes following up with your prospects as easy as clicking 'send' on a message. Through their tracking and analysis, you can see at a glance where your efforts are working and double down in those segments to turn your lead into customers. Customers are tired of feeling like data blips on a screen. Postlead uses automation to customize your follow-up message and send out postcards with a personal touch that gets results. We're so sure you'll like our system, that we offer a free trial. Are You Ready To Bring Your Direct Mail Into the 21st Century? 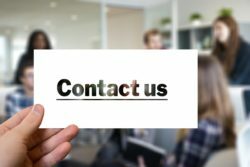 The team at Postlead combines technology with traditional direct marketing to give you an efficient, cost-effective way to build your business. There are no contracts or monthly payments, and everything is done at your own pace. You'll also receive expert advice and support from a team that offers more than 35 years of experience. When you're ready to get started, contact Postlead.